Spiders fascinate me and as we have a thread for snakes and reptiles, I though it would be very interesting to see everyone elses photos of spiders. So please share as many photos of spiders as you like! Here's a lovely male Huntsman that came inside to escape the rain. In the last shot I used my hand as a size comparison, my hand is 18cm long so he was quite a nice size, maybe fourth or fifth moult? Another great idea for a thread Elsie, your Huntsman has some serious size, nothing that big here in Tassie, that I am aware of. 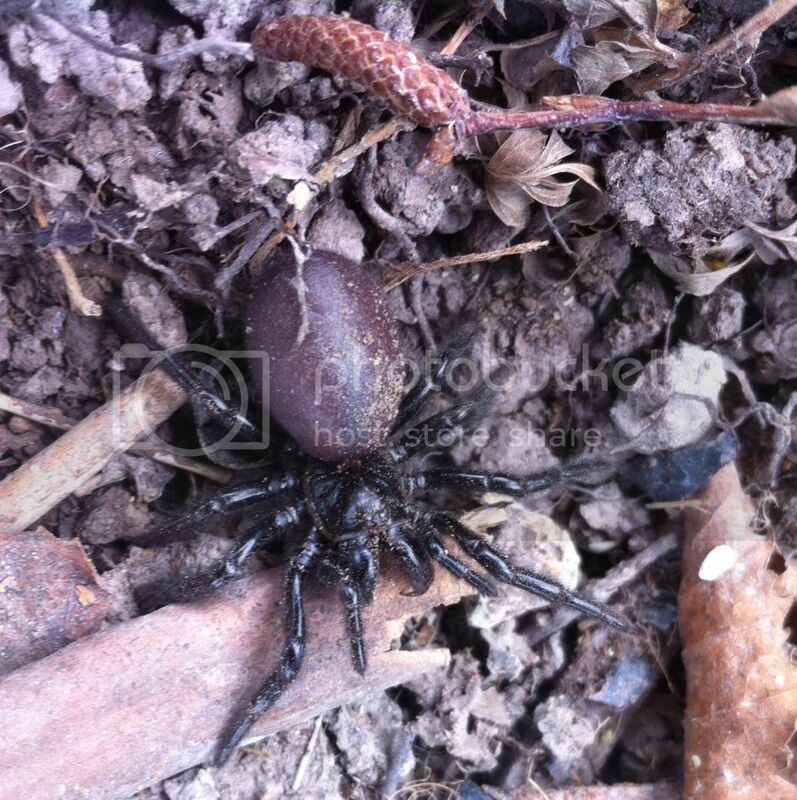 here is a nice female Mouse Spider (I can be corrected if ID is off), taken at Woodbridge, Tasmania last summer. Sorry only a phone photo. Hmmm... what is the difference between a mouse spider and a funnelweb? Not sure what type of spider this is. Any suggestions are welcome. Sorry about the quality as this picture was taken over a year ago (and my photography skills have gotten a lot better since then). By the way, all the photos so far are really cool and the underside of the huntsman in soakes photo looks almost like a face of a monkey. Hey Soakes, interesting question, I found this chart which migh help, shows photos of both species, male and female next to each other. To me it looks like the length of the spinnerets, (can't see the spinnerets in my pic) and the shape of where the body meets the head. We have funnel webs in Tassie, but not as dangerous as the Sydney variety. I am no expert, although not scared, I am more nervous around spiders than snakes! Okay, thanks for the IDing the little spider. Looks like a Black House Spider, TBL. I just looked it up and the spider does look more like a B.H. Spider than a common garden one...thanks zostertops. I think that's a Garden Orb Weaver. I haven't seen any Golden Orb Weavers so far this season but I've seen two Garden Orb Weavers which I had identified from a photo by the SA Museum. Beautiful spiders everyone! Tegan, I'm fairly sure that it's a male as it has a small abdomen and large pedipalps. A female will have a large abdomen and small pedipalps. Thats a really good chart dwatsonbb, very useful! 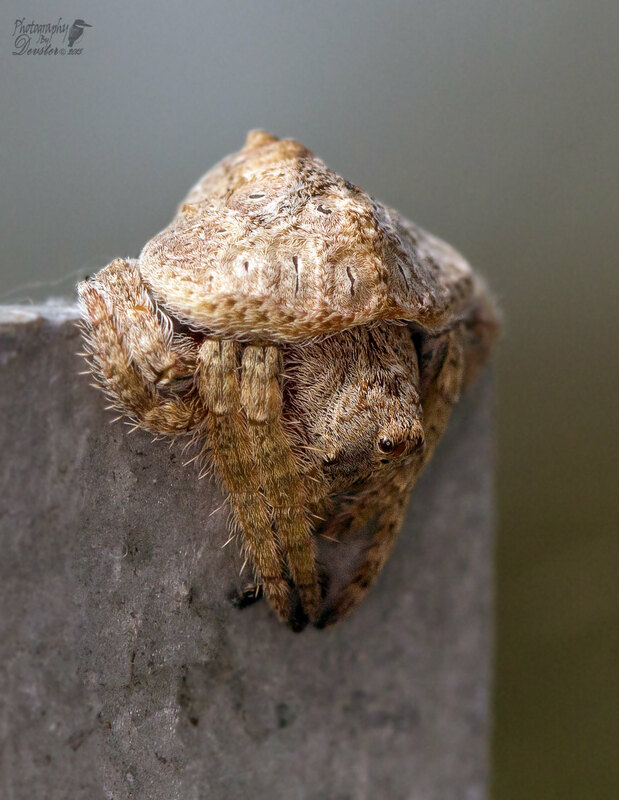 Here are a few from my neck of the woods, including a Garden Orb Weaver. Wow, good photos. That first one looks squashed! 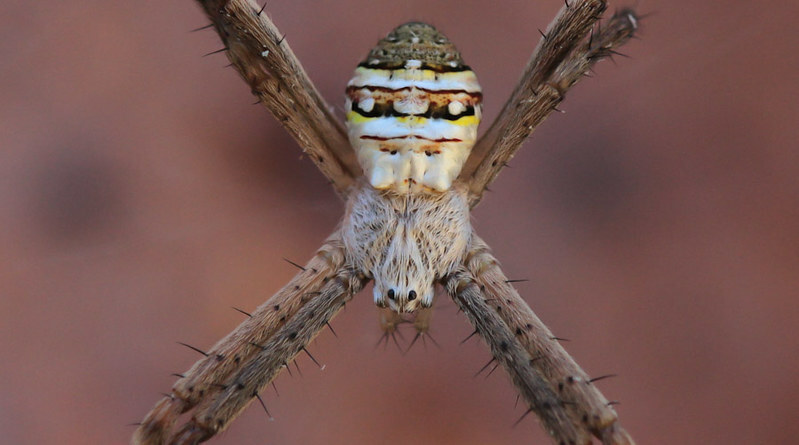 Here is a spider I saw when I was in Spain earlier this year. Does anyone know what it is? Yes, it does, Soakes. It's a Flat Bark Spider. Ms Woko & I have dry stone walls at our place & I sometimes see a Flat Bark Spider under the flat stones in the wall. Perhaps it thinks it's a Flat Stone Spider. How did you get such a white background for the red back Rick? Cheated a bit Teagan :-), spider in a white bowl. Returned to the wild unharmed. First the Breakfast Bowl. Then the Super Bowl. And now the Spider Bowl. Very inventive, Rick. an update guys, we just had a huge male Huntsman right above my head, my sister said I have a huge spider above my head, I didn't belive her, she is always doing that, she knows I'm scared of spiders, so I'm just like huh yeah right! Once I see one huntsman in the house I'm paranoid that they are all over the place! I agree great idea for a thread. 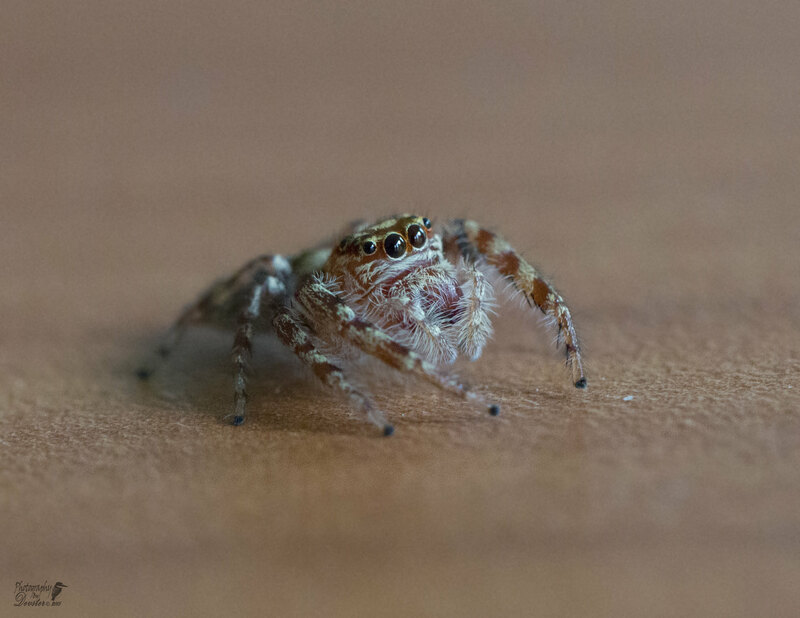 I have jst bought a Macro lense so I am starting to take more photos of spiders than birds lately. The first I think is a Wrap Around Spider. Either that or just a Garden Orb during the day. The next is a Garden Orb at Night Eating. The last one is a Jumping Spider but not sure which one. I have so many more spider photos to go through yet, I look forward to seeing more. Those mouse spiders look like a force to be recond with. Awesome shots Devster! I love the jumping spider. Not many spiders around here at the moment. I suspect the intense dry spell has curtailed their activities as well as their populations. It never ceases to amaze me how water is so critical to wildlife (as well as human) abundance. But what is also amazing, at least in Australia, is how, in spite of so much of our great nation being arid, there is so much wildlife which has adapted to that aridity. She must of moved on, the male is so tiny, he had better watch out if does not want to get eaten, his abdomen looks like a mini red jelly bean! Lol Rick I agree, thats why I only do it when I am not birding not instead of birding. Oh, I'm slowly convincing my wife I need to head down that way this year for some birds, whats the best time? Some sort of jumping spider, although I am not sure which one. Bird Lover, what sort of size is that spider? It was only about 1 cm from the widest point. It looks bigger in the pictures but, believe me it wasn't that big at all. Peacock Spiders featured on the ABC TV News a couple of nights ago. I'd never heard of or seen them but the presenter said they're quite small & common, especially in south east Australia. Evolution certainly produced a pile of stunners in this lot! And the humans in our household found the courtship antics of the males most entertaining!